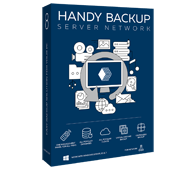 The new version of our popular backup software Handy Backup allows you to achieve a new level of data protection! System administrator installs Handy Backup on an employee’s PC. Then, he sets up backup and restore tasks and schedules them. After that, he enables e-mail notifications, so he can always stay informed about backup status. Finally, he turns on operation as Windows service. With the above steps, the employee’s work data will get backed up absolutely unnoticeably, without any danger that tasks will be removed or modified. Automatic backup software for Windows servers and workstations. Free 30-days trial version! Note: Another very powerful feature of running backup as service is that it doesn’t require the user to be logged into the system. The only requirement is to have a computer turned on, and Windows OS loaded on it.